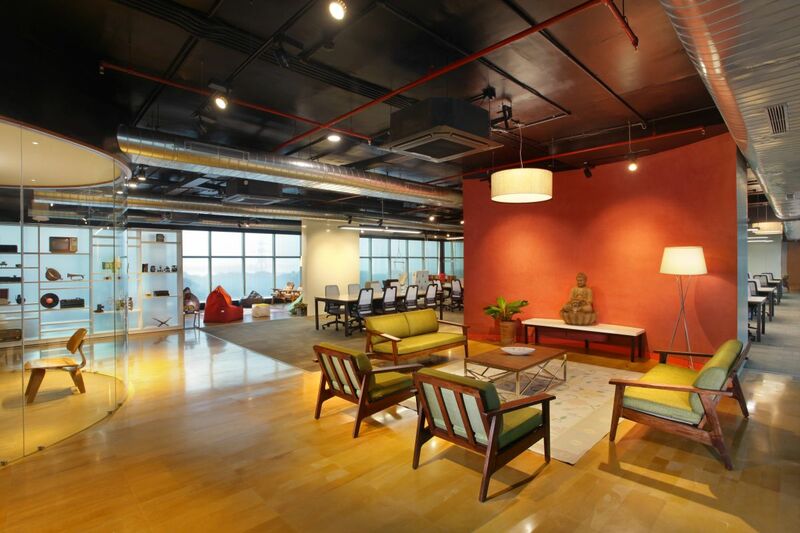 Interior Design: Inshorts Media Labs at NOIDA, by Edifice Consultants Pvt. Ltd. - ArchitectureLive! 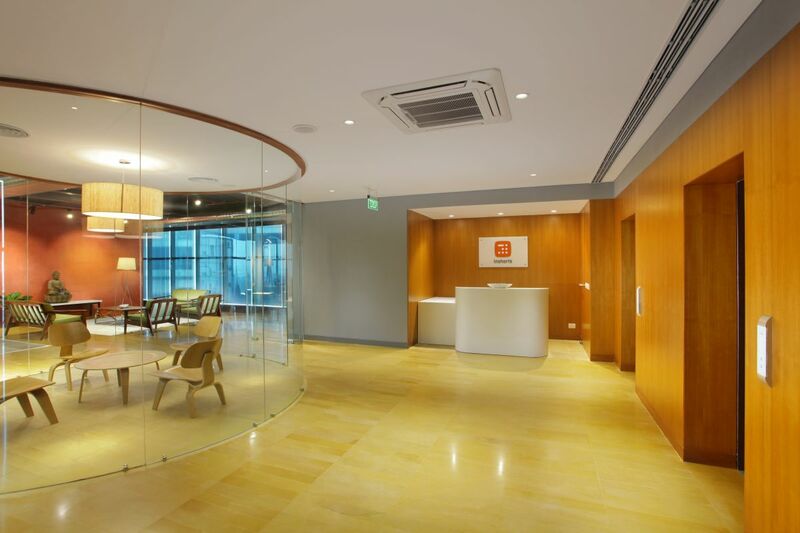 Text and Images: Edifice Consultants Pvt. Ltd. 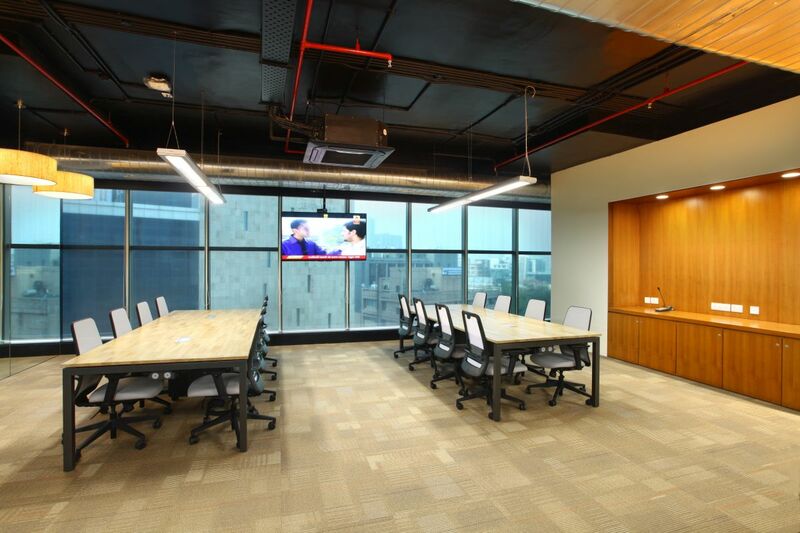 Designed by Edifice Consultants located in NOIDA, on the 6th floor of a commercial building, Inshorts is a young media company, with an energetic vibe. 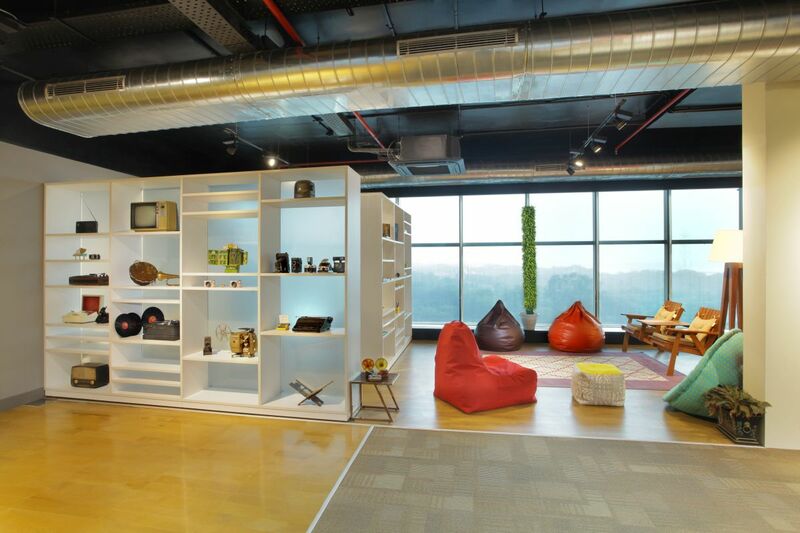 With a creative and young team as well as a 24×7 operations, the client’s brief called for a set up that would energise the young crowd, aid the open office culture and work well within tight budgetary constraints of setting up the office. Founded by three IIT drop-outs, the intent was to have a space that would emulate the idea of a home; wherein the reception would manifest itself as the drawing room, the cafe would translate into the dining room, etc. 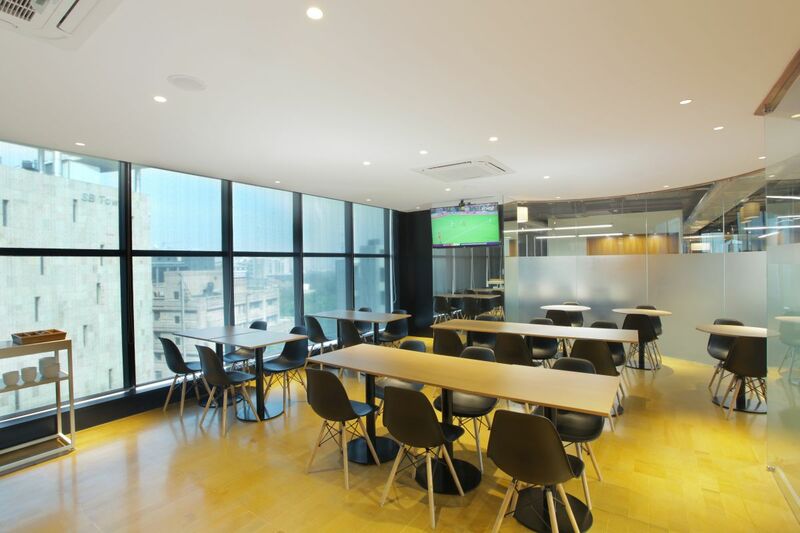 With an existing office on the 4th floor of the same building, sufficient and insightful feedback was shared by the client on their spatial requirements including common requirements such as team briefing spaces, and unique requirements such as acoustic barriers between the gaming areas and the working areas. Such customized inputs enriched the brief. The building is oriented with its service cores on its shorter, East-West sides, and the largely open floor plate facing the North-South sides, held between the cores.The Southern side has imposing views while the Northern side faces the commercial hub and overlooks neighbouring buildings. An existing double-glazed system on the façade with a high performance low e-glass, aids in keeping the internal heat gain in check. The Jaisalmer stone seeps into the office from the lobby over the threshold and the glass entrance to the office aids in this seamless transition. This adds depth to the perception of the space as seen from outside the office and immediately creates a visual engagement. In order to create this engaging visual and sensory connectivity, the columns were masked with sculpted design elements that act as tactical separators. A composition of positive and negative spaces has been created for the office where the built volumes define the unbuilt interstitial spaces. 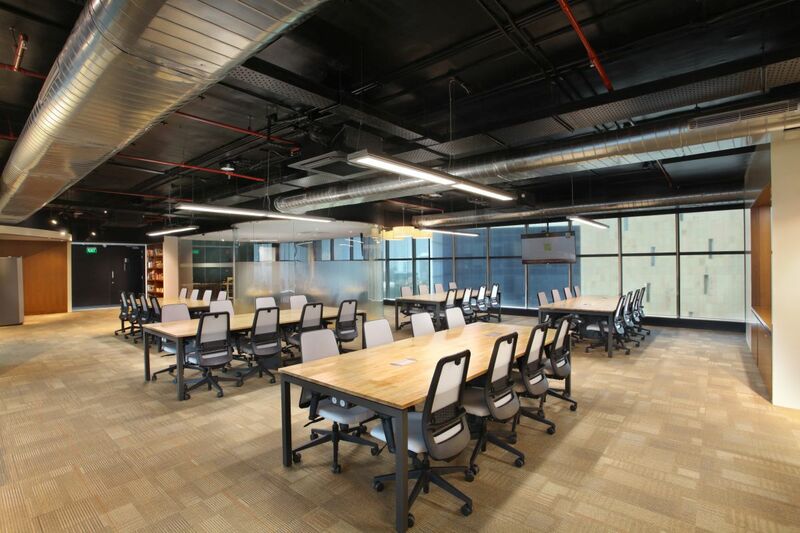 Work spaces are designed to cater to the needs of up to 6 teams each comprising of 6 to 8 members. The work areas have been designed to facilitate group working and discussions as an alternative to traditional formal spaces, with an attempt to create an informal zone that is more relaxed and personalised. Simple tables have been assigned for team meetings and varied clusters of alternative work areas have been considered for other formats. The ‘living room’ is conceived with the background landscape layer that sits against the backdrop of hand finished paint, framing and balancing the views. Together with a comfortable sofa seating set around a floor rug, it brings in the element of the home within an office, as defined in the client’s original design brief. The formal worktables double up as meeting spaces, and have been set more towards the north and the centre, to benefit from the diffused Northern lights. Open Wi-Fi connectivity enables the users to move around with ease and work anywhere within the office. The South edge has been developed as a deck with an alternative working environment that promotes and encourages informal discussions. 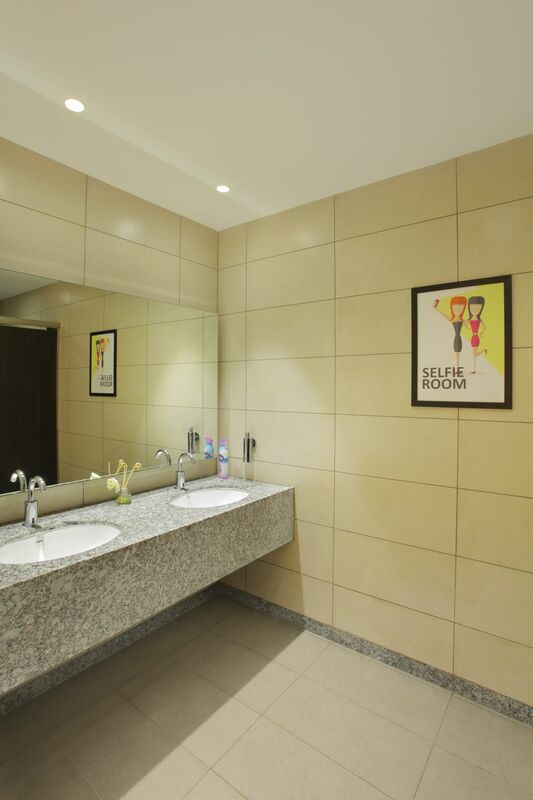 A newsprint graphic, a collage of stories by the Inshorts employees is conceived as a screen for the ‘engage area’, which is the more public zone of the office that blurs the office interiors and renders privacy to the more exclusive and restricted areas. Table tops are made from wooden planks, resting on a simple mild steel frame to give a warm, comfortable yet rustic feel. Privacy is ensured between workspaces and flexi-meeting spaces by means of looking through the lattices. The current shell’s floor to structural ceiling height is low at 3.3mts. 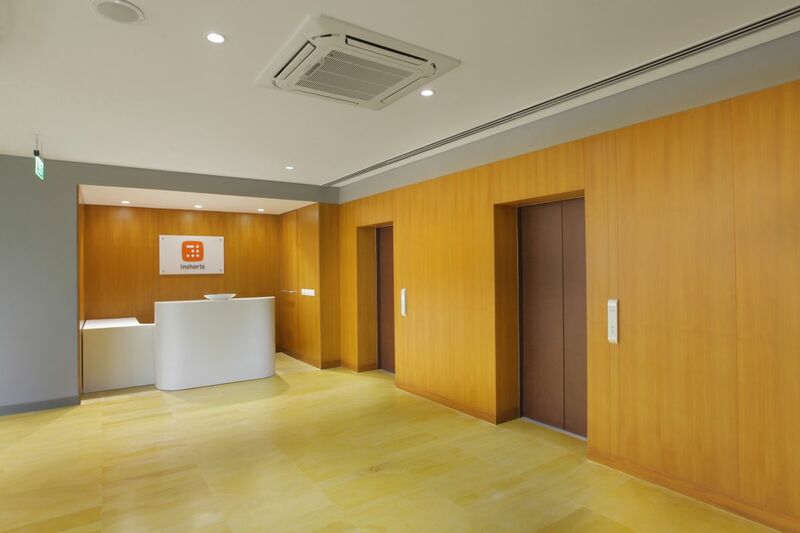 An exposed aesthetic has been employed that allows for an increased height, while addressing the budgetary concerns by eliminating the false ceiling. The existing glazing members were black in colour; this was colour matched with the ceiling, creating a dark upper wrap that would hold all the elements together. The developer of the premises has provided chiller and ahu system which runs for 12 hours from morning to night. Since the client operations are 24 x 7, the night shift is serviced by VRF cassette systems. Black mesh roller screen blinds have been planned as well to address the southern glare and also, to further merge with the décor. The key indoor landscaping strategy is to create a collaborative deck is crafted around planted lattices that can be moved around to reconfigure spaces as per requirements. With a view to workingwithin the monetary constraints of the project, this measure will be executed in the second phase. Indoor plants used are for the green-scaping; the more commonly known indoor plants such as Epipremnum aureum or Money plant, Sansevieria trifasciata or mother-in-law’s tongue, peace lily and areca palms are positioned to purify the indoor air environment. Tall movable plant lattices have been planned on the southern deck, which act as space dividers and also shade the southern deck when the sun screens are rolled up. The positioning of this lattice also becomes a comforting element infusing dappled light through foliage into the informal work lounge. The metal lattices houses 200mm diameter self-watering pots of money plant creepers.